The rat is the first symbol in the Japanese zodiac. Legend has it that when God called for all animals to attend a New Year’s greeting, the rat arrived there first by secretly traveling on the back of the ox. 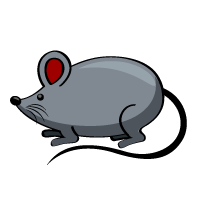 As rats breed fast, this symbol represents “prosperity of descendants” and “social success”. Rats are charming, smart, ambitious and hard-working. They have a tremendous capacity for pursing their goals. On the other hand, they can be cunning, calculating, and tight with money. Have only a few long-lasting friends. Do not easily show their true feelings. Rats are most compatible with dragons and monkeys. If these three come together, it generates a great positive power. Rats also have a mutually beneficial relationship with oxen. Horses are the least compatible with rats. In Japanese, a rat is “nezumi” in romaji and is written as “鼠” in kanji. In the Japanese Zodiac, however, a rat is often called “ne” and is written as “子”.